CENTRAL PA RACING SCENE: HEIMBACH, GARLOCK & LAWTON THRILL FANS WITH WHEEL-TO-WHEEL RACING ON SUPER SELINSGROVE TRACK SURFACE! HEIMBACH, GARLOCK & LAWTON THRILL FANS WITH WHEEL-TO-WHEEL RACING ON SUPER SELINSGROVE TRACK SURFACE! 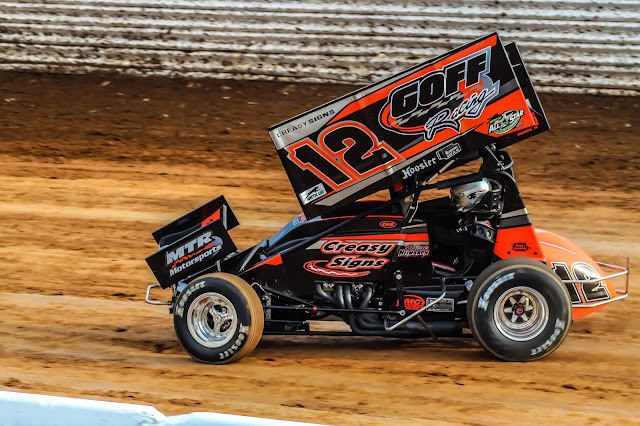 SELINSGROVE, Pa. – Blane Heimbach of Selinsgrove scored his second $5,000-to-win 360 sprint car race of the season at Selinsgrove Speedway in the 18th annual Mach 1 Chassis Open Saturday night. The race was one of the most exciting of the year with the front runners exchanging the lead, pulling off slide jobs, and then having Heimbach make a late-race charge by Chad Layton of Harrisburg to take the win in the 30-lap main event. Earlier this season Heimbach won $5,000 in the Lucas Oil American Sprint Car Series event at the track. The win was Heimbach’s 38th career in 358-360 sprint car competition at the Snyder County oval at the wheel of the Creasy Signs/Goff Racing No. 12. Rance Garlock of Three Springs held off multiple challenges for the lead and win for his $2,000 first career victory at Selinsgrove Speedway in the 25-lap super late model race, while Shaun Lauton of Bloomsburg fended off Brandon Moser of Middleburg for his fourth checkered flag of the year in the 15-lap pro stock race. Selinsgrove Speedway is back in action at 7:30 p.m. Saturday, Aug. 11, with the 360 sprint cars, super late models in a Moon Shine Camo Route 35 Challenge Series race, the Mid-Atlantic modifieds, and pro stocks. Track gates will open at 5 p.m.
Polesitter Chad Layton stormed into the lead at the start of the 360 sprint car feature and was chased by fourth-place starter Cody Keller. The caution flag regrouped the field on lap two when Derek Locke’s car lost a front wheel and spun in turn two. When the race resumed, a torrid battle for the lead unfolded between Layton and Keller, with each driver pulling off slide jobs through the corners and swapping the lead. Racing a close third was front row starter Kyle Reinhardt. Through lap 10, Layton and Keller see-sawed for the lead with Reinhardt in striking distance. Reinhardt made a move for second on the 10th circuit and set his sights on Layton. At the halfway point, Layton had another serious challenger for the lead in the form on Reinhardt. With 10 laps to race, Layton led Reinhardt, eighth-place starter JJ Grasso, seventh-place starter Blane Heimbach, and Keller. An intense battle for the third position took place between Grasso and Heimbach until Heimbach secured the spot on lap 22. Two laps later Heimbach soared around Reinhardt and started to reel in Layton in the final laps. Racing out of turn four on the 28th lap, Heimbach made the winning pass using the inside lane. Layton attempted to get the lead back to no avail. Heimbach was victorious by just 2.3 seconds over Layton, Grasso, 12th-place starter Davie Franek, and Reinhardt. Front row starters Dan Green and Rance Garlock drag raced down the frontstretch at the start of the late model feature with Garlock pulling into the early lead. On the second circuit, third-place starter Jim Yoder drove by Green for the runner up position and closed in on Garlock. At the completion of lap five, Garlock was leading fourth-place starter Hayes Mattern, Yoder, points leader and eighth-place starter Bryan Bernheisel, and sixth-place starter Kenny Trevitz. The caution flag regrouped the field on lap eight when Randy Christine spun in turns three and four. At the halfway point, Garlock was being pressured by Berheisel and seventh-place starter Brett Schadel as he was also showing a lot of speed. Mattern withdrew from the race on lap 15 as the race at the front of the pack got intense. Schadel passed Bernheisel for second and began challenging Garlock for the lead until the caution flag came out for Jim Yoder’s racer in turn four. On a lap 18 restart, Schadel was able to get around Garlock for the lead only to have it called back due to another caution flag. With five laps to race, Bernheisel reclaimed second and threatened Garlock for the lead and win. At the checkered flag, Garlock took the win by a mere .28 of a second over Bernheisel, Schadel, Christine rebounded for fourth, and Trevitz. Front row starters Shaun Lawton and Tommy Slanker dueled for the early lead until Lawton secured the front spot in the pro stock feature. Third-place starter Brandon Moser drove by Slanker on the second lap for the runner up position and started to gain real estate on Lawton. By lap five, Lawton was leading Moser and Slanker while a close battle for fourth took place between fourth-place starter Kyle Bachman and fifth-place starter AJ Hoffman. With five laps to race, a three-wide race took place for the third position between Slanker, Bachman and Hoffman. In the final laps, Moser made a last-ditch effort to get around Lawton for the lead and win but came up short by the slimmest of margins. Moser settled for second with Hoffman, Slanker, and Bachman rounding out the top five.